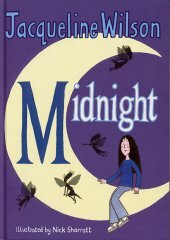 It's another beautifully written Jacqueline Wilson story, but there's not a lot of fun in this one. It's all about Violet and how she copes with her difficult family. She's got this brother you see, only, he isn't really her brother because he's just discovered that he was adopted when he was a baby. But Violet absolutely insists that she loves him just the same. Violet has always adored Will, even though sometimes, he terrifies her. I knew Mum longed for a proper girly daughter to confide in. But I never knew what to say to Mum. We didn't have a thing in common. It was almost as if I was the one who was adopted. What was I doing, still playing these weird games with Will? Why did I always let him control me? He didn't really have any power over me. He couldn't make me do anything, not if I stood up to him. I just didn't know how to do it. Violet really needs to talk it over with someone. When Jasmine, self-possessed and beautiful, starts at Violet's school they become instant friends. Now, is Jasmine really on Violet's side, or is Will going to spoil it all? And who else is there that Violet could talk to? This is a surprisingly powerful story and it quite scared me, wondering what Will was going to do next, so I had to read it really quickly. Highly recommended! One thing though, I was left wondering what was Violet's thought process that led her to make the changeling baby out of her ragbag of bits at the end of this story? Remember the illustration, right at the beginning of the book, of the changeling child? Fairies steal away beloved babies and leave a changeling child in their place. These base elfin breeds are often evil, with difficult, demanding natures and enormous appetites. Perhaps after her conversation with Casper Dream Violet had faced up to the fact that Will was less than perfect as a brother? That didn't mean she didn't love him any more, but making the changeling child might have helped her to break the apparent hold that he had over her.